Vegan Runner Eats » Tried And True Recipes Series » Tried and True Vegan Recipes Series, Episode #2: Five Recipes From All Over The Blogosphere, Tested And Reviewed! Hi everyone! Today I’ve got another episode of the Tried and True Vegan Recipes series for you. In this series, I’m sharing with you a few recipes from various blogs and cookbooks that I’ve recently tried and liked (or didn’t?). This way, you get to experience lots of vegan deliciousness from sources you may have not heard of before, and try out these recipes yourself! In case you’ve missed part 1 of this series, you can find it here. 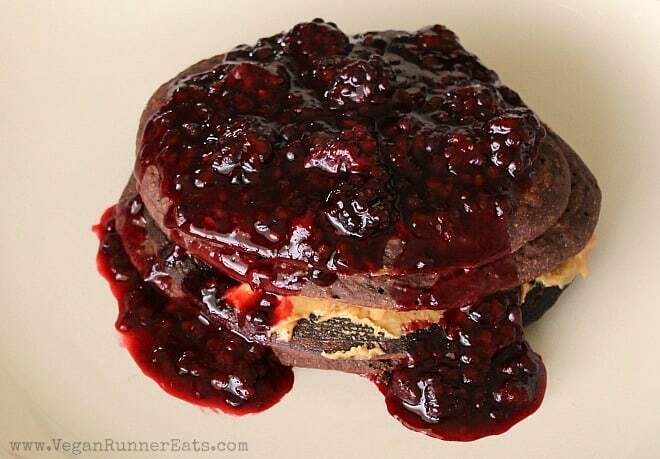 Recipe #1: Dark Chocolate Pancakes! I usually don’t go very complicated with breakfast during the week, but on weekends all bets are off! Pancakes are quite a regular staple as a weekend breakfast in our house, often served with fruit, peanut butter and whatever else strikes our fancy. I’ve made these Dark Chocolate Pancakes by Lindsay S. Nixon of the Happy Herbivore blog a few times in the past months, and boy are they good! These pancakes come from Lindsay’s second cookbook, Everyday Happy Herbivore . Besides the fact that they are deliciously chocolatey, they are also surprisingly easy to make: the batter comes together in minutes, and they behave very well in the pan without sticking to it at all, even when the pan is not greased (I use nonstick pans, however – the story may be different with regular pans). Rich chocolate flavor + easy to make = a win-win situation! The last time I made these, I decided to top them with a super simple blackberry topping: blackberry bushes grow all over Whidbey Island, and this time of the year they are covered with lots of ripe berries that are begging to be picked. I collected a couple cups worth of blackberries in my backyard the day before I made these chocolate pancakes, and decided to make the topping that you see in the picture above. Not only was this topping delicious, it also complimented the sweetness of the pancakes very well with its slight tartness. Here’s the approximate recipe for the blackberry topping (my own creation): Put 1 cup of berries into a heated small pan, add water to cover the berries halfway. Bring to a boil, reduce the heat to a low simmer, and let the berries cook for 2-3 min until they start breaking down. Meanwhile, mix ½ tsp cornstarch (use organic) with 2 Tbsp cold water in a small bowl, stir until the cornstarch lumps disappear and the mixture is uniform. Add to the pan with berries, stir to incorporate for 30 seconds, breaking down the berries slightly with the spatula. Add 1 Tbsp raw sugar, stir until the sugar is dissolved. Take off the heat, let cool slightly, and top your favorite pancakes! I’ve been a huge fan of vegan pho lately. For those of you who isn’t familiar with this soup, pho is a Vietnamese soup that’s traditionally made with bone broth, rice noodles, mushrooms, bean sprouts, basil leaves and a few other ingredients. Thankfully, a number of restaurants serving pho have embraced the fact that vegan people want in on the action too, so it’s usually not a big deal (at least around here in Seattle area) for us to find a veg-friendly pho version when we go out to eat. But what about making it at home? 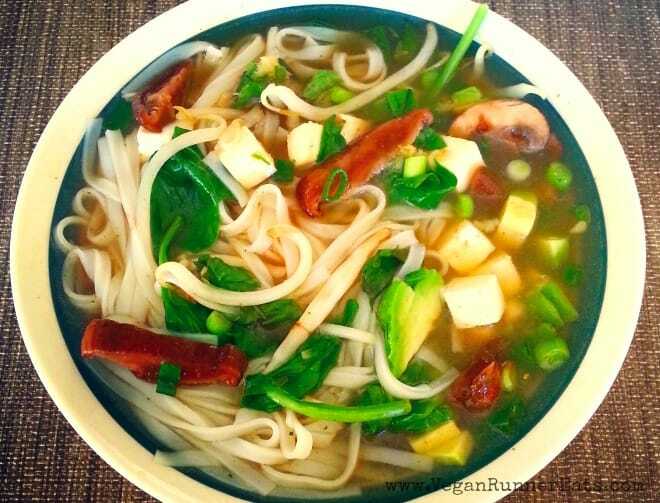 Recently I’ve stumbled upon this pho recipe from Oh My Veggies blog. The recipe itself isn’t completely vegan because it calls for cooking the mushrooms in butter, but I was able to skip this successfully and cook the mushrooms in a bit of veggie broth, thus cutting on the overall fat. The soup came out dee-licious! Rob was raving about it for a few days, and I kept coming back to thinking about it. The only downside that we encountered is that we must have used every single pot and pan in our kitchen to go through every step of pho making – the broth and the rice noodles have to be cooked separately, the mushrooms require their own pan, etc. Since we don’t have a dishwasher in our house right now, it was an ordeal to do the dishes afterwards, but at least the soup was tasty! 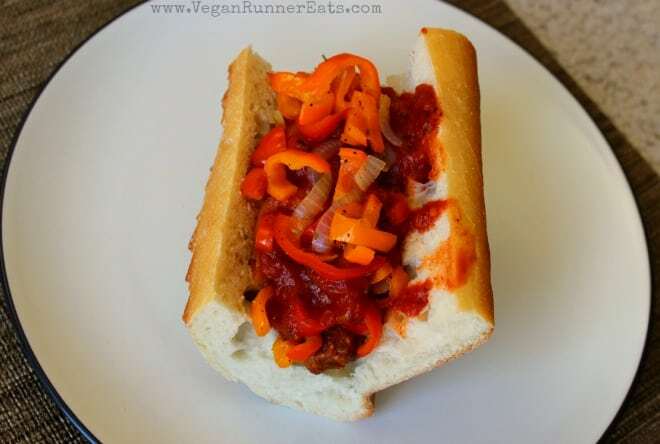 A few weeks ago, I saw that Susan Voisin from FatFreevegan.com had posted a new recipe for homemade veggie dogs. 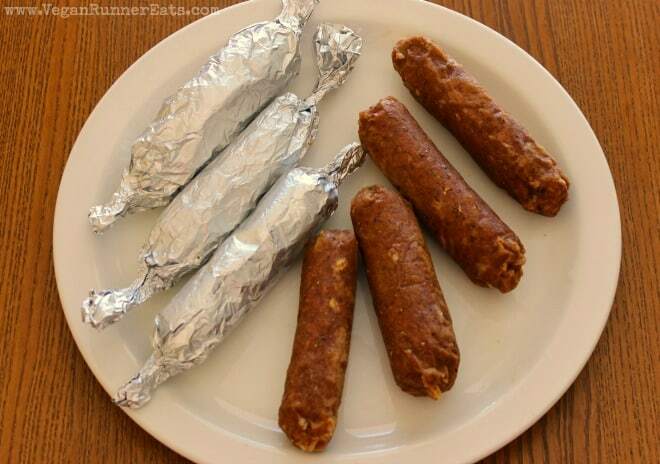 Susan was inspired to create a lower-fat version of Field Roast frankfurters, and the resulting veggie dogs were a huge hit with her family. I’ve mentioned my love for Susan’s culinary ingenuity a few times before, so I decided to give her new veggie dogs a try. While making these from scratch for dinner on a weekday may be a bit much, I definitely recommend making a batch on the weekend when you have time, and using them in various recipes during the week. I’ve been looking at this recipe from Kathy Hester’s The Great Vegan Bean Book for a long time. It just looked so delicious, but I seemed to never have all of the key ingredients at home at the same time. Finally a couple weeks ago, IT HAPPENED! 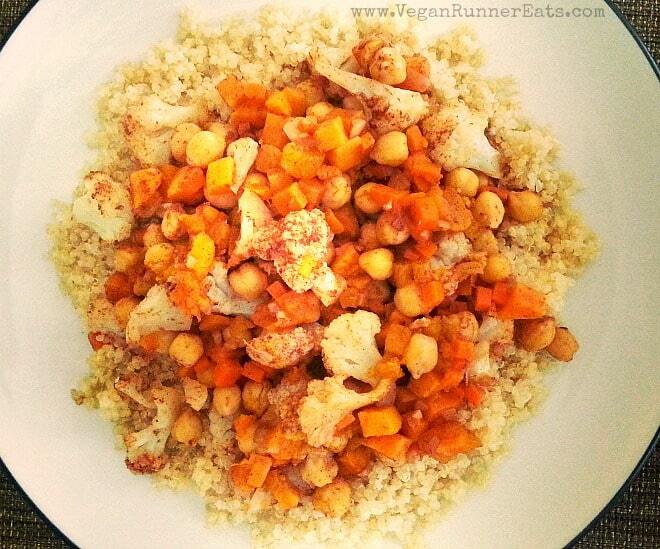 The recipe calls for chickpeas, bell peppers, cauliflower and – surprise! – dried apricots along with some aromatic spices typical to Moroccan cuisine. Kathy notes that this dish is best when cooked in a classic Moroccan tagine dish , but in case you don’t have one, a Dutch oven will do. I went on to use a Pyrex glass casserole covered with aluminum foil. When Rob saw me assembling all of the ingredients, he wondered if the tagine was going to come out on the dry side since there was no sauce of any kind involved. Once the dish was done baking, however, we found that it was perfectly tender and moist: all of the flavors blended together nicely, and even the chickpeas had a pleasant texture. I find all too often that chickpeas can come out dry unless there’s lots of sauce of some kind in the dish – thankfully, this wasn’t the case in this recipe. Kathy suggests using couscous as the accompaniment to this dish, but I didn’t have any on hand, and used quinoa instead as you can tell from the picture above. 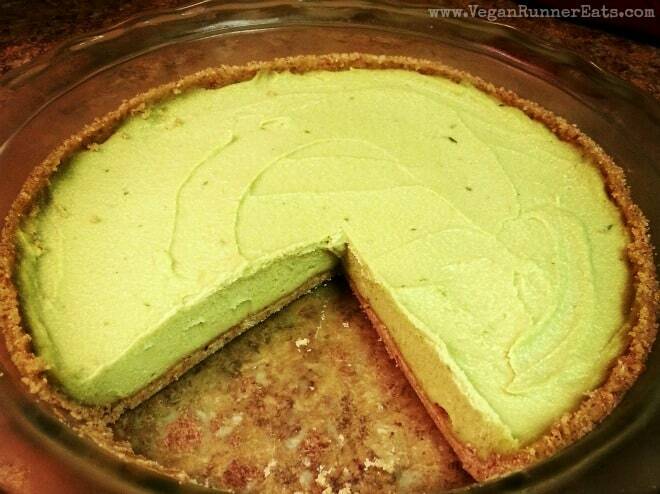 Recipe #5: Vegan Key Lime Pie! Of course there has to be some dessert! This key lime pie recipe comes from Gena Hamshaw’s recently published book, Choosing Raw: Making Raw Foods Part of the Way You Eat , but I found it in Ricki Heller’s review on her site over here. As soon as I saw the recipe complimented by Ricki’s beautiful photography, I knew that I had to make it! My photography is far from being as good, but the key lime pie turned out delicious nonetheless! This recipe can be filed under the ‘occasional splurges’ category because it calls for such decadent ingredients as avocado, coconut and a whopping 3 1/2 cups of cashews (for the whole pie, not a single serving 🙂 ). I managed to leave out the coconut oil, and the filling still turned out good. Another change: I used a pie dish instead of a springform pan, which made the crust thinner overall, but it reached the edges of the pie uniformly. The pie crust was exceptionally good: we had a bit of leftovers after our pie was assembled, so Rob and I gobbled it down with huge smiles on our faces. One more thing I would do differently next time: I would add more lime juice. I used slightly more than the 1/4 cup listed in the recipe, but another 1-2 Tbsp wouldn’t have hurt. So these are my top 5 of the recently tried recipes by other bloggers and food writers. I’ve enjoyed writing posts in this series quite a bit, so I’ll try to make them a regular feature here on Vegan Runner Eats! Question for you: What recipes by other bloggers have you recently tried and liked? Please share with us! Stay in touch with Vegan Runner Eats by subscribing in the top right corner of this post, or by following the blog on Facebook, Twitter, and Instagram! Tagged Fat Free Vegan, Susan Voisin, tried and true recipes, vegan blogosphere, vegan breakfast, vegan dessert. Bookmark the permalink. 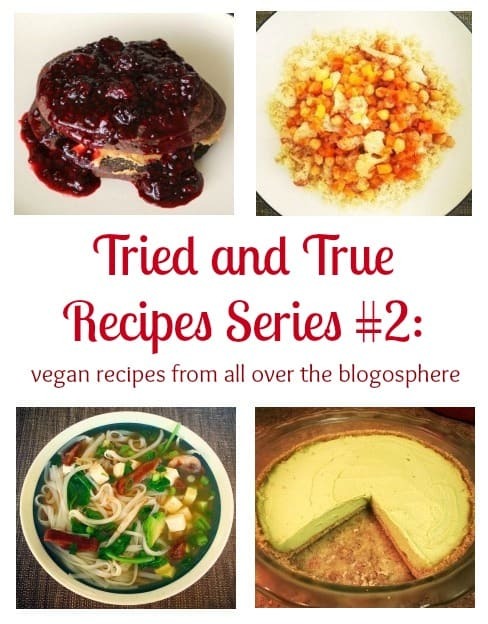 5 Responses to Tried and True Vegan Recipes Series, Episode #2: Five Recipes From All Over The Blogosphere, Tested And Reviewed! Pumpkin enchiladas – that sounds delicious! Tee Bone, do you put pumpkin inside the enchiladas, or do you make a sauce with it to go on top?